Bounce rate is the percentage of visitors that view only a single web page and then leave the website. Analysing Causes for Bounce Rate Rather than just doing an overall percentage bounce rate analysis, I wanted to look further into what sources of traffic cause this, so I generated a custom report for this to show each type of traffic to analyse the highest bounce rate. Setting this report up is good to use a custom report as you can output exact data needed. The below screenshots shows howe to create a custom report in Google Analytics to extract referral traffic. In the report content, enter another name for the specific data you want to extract, then enter a name for the type of metrics that you want, in this case I left as is because all my metrics are in the same row. 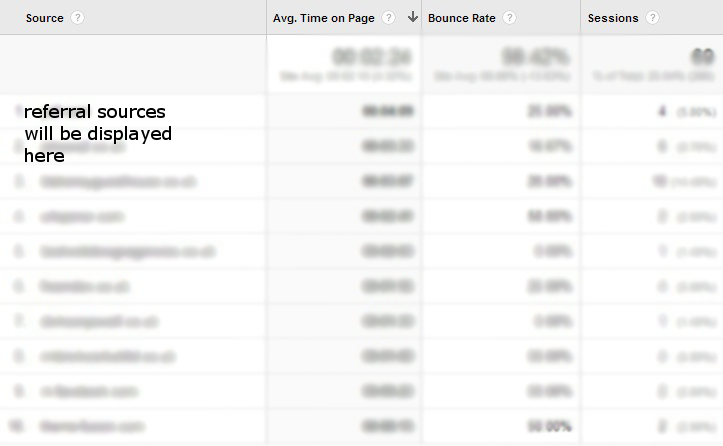 The metrics I want to know in this example are the average time a visitor spent on the page, the bounce rate and the amount of visits from the traffic. Dimension Drilldowns enable you to structure the steps which you want to see your data, so in this instance we want to see the type of traffic, then when we click a traffic type we want to see the actual source of the traffic. We can add various dimensions and drag up and down dependant on the steps we want. Save the Report and this will give you the results below which structures the data as in our dimension drilldown. This displays the types of traffic.Select referral traffic. This is great as it shows us exactly what data needed for each traffic type and we can also setup and compare multiple metrics and see this in our report too. Setting up this custom report could show us that the overall site bounce rate is affected by a particular traffic source, for example, the paid traffic being sent to the site could be coming from adverts that convey the wrong message and therefore confuse the user journey.